So there's a scene near the end of Twilight where good vampire Edward and his huge eyebrows are trying to save his lurrrve interest, the very Mary Sue-ish Bella, from the bad vampire whose name I forget, but he looks just like Jay from Clerks, and ZOMG! it's so tragic and everything... and I laughed. Out loud. Heartily. Uncontrollably. It's really a wonder I was run out of the theater by a horde of iPhone and pitchfork wielding 14 year old girls. But honestly, I was amazed they had enough scenery to pass around for everyone on screen to chew at that moment. But all things considered - and I'm sure I'll lose some geek cred here, but whatever - I didn't hate the movie. I didn't particularly like it, either, but it wasn't nearly as painful as I was expecting. You see, my wife really wanted me to see it, as she read the books in the space of about a month a little while back and had already been to the movie with a friend - twice, I might add, since spiritually she's still about 15 most days - and wanted to finally get my reaction. Also, she has the hots for Robert Pattison (and his Peter Gallagher-lite brows), the dude who plays Edward. To be fair, I approached it with as open a mind as I could... I mean, a quick glance at my own book and DVD shelves shows that I really don't have a leg to stand on when it comes to making fun of folks' pop culture tastes, so I attempt to be understanding. And while it really wasn't my thing - if you were expecting a 2 hour CW drama, you made the call! - it was un-bad enough to make for a decent date night flick with the wife. And if I'm being honest, there were a few things I liked, such as the baseball sequence. It was kind of a clever idea, well-shot, and made excellent use of that Muse song that's been getting all the radio play the past couple of months. Someone involved on some level, I'm assuming the director or cinematographer, seems to have enjoyed all the same "the X-Men play baseball" comics I did, and it comes across on the screen. 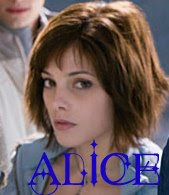 And I have to admit to crushing on Edward's psychic "sister" Alice, or at least the actress playing her (Ashley Greene), by movie's end. Particularly in said baseball scene when she's pitching. She looks very determined, and I'm a sucker for a determined woman in a pixie cut. who I've been enamored of since seeing her on Swingtown last summer, as the bad female vampire whose name I also forget, and though she has maybe 5 minutes of screentime, I thought she was pretty good. And hot. Especially in, again, the baseball scene, where she brags about her wicked curveball. Hmm... apparently I have a thing for hot female vampires who play baseball. If Rule 34 applies here, please refrain from providing examples, thanks. And if it doesn't, I should really go register a domain name ASAP. Anyway, Twilight... less than awful. And given my expectations, I think that's really sayin' something.